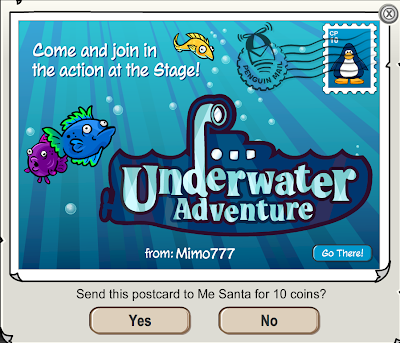 Club Penguin Cheats by Mimo777 Club Penguin Cheats by Mimo777: Club Penguin Underwater Adventure Postcard! None of my friends play anymore, so I have no use for postcards, really. LOL Mimo cant say anything about the new stuff. The stamps better be good since the CP guys havent done anything. Cool. Too bad you can't put your own stamp on it from your stamp collection. lol. I wanna summer party, like the water party. Poor fish it looks like it was rick rolled on youtube. Poor little thing it will never be able to go on youtube again. that looks so cool!! Mimo i cant wait tll somebody seandz me that!! This is off topic, but I wonder if you ever noticed this. We got a metal for Field Ops, and if you click the metal, you can play a little mini game using your mouse to lead the ball to the "X". imence mimo u are awesome !! Hey Mimo, just thought you'd like to know that CP has put a few more pins in the gift shop catalog. One I know is Costa Rica. There a few others as well. Just thought you'd like to know. ~~~~~~~~~~~~~~~~~~~~~~~~~~~~~~~~~~~lol shizel eyes my freind can do shizel eyes some how??? ~~~~~~~~~~~~~~~~~~~~~~~~~~~~~~~~~~~2 person who said this i must investigate! Me too that would be awesome to have a postcard collection! 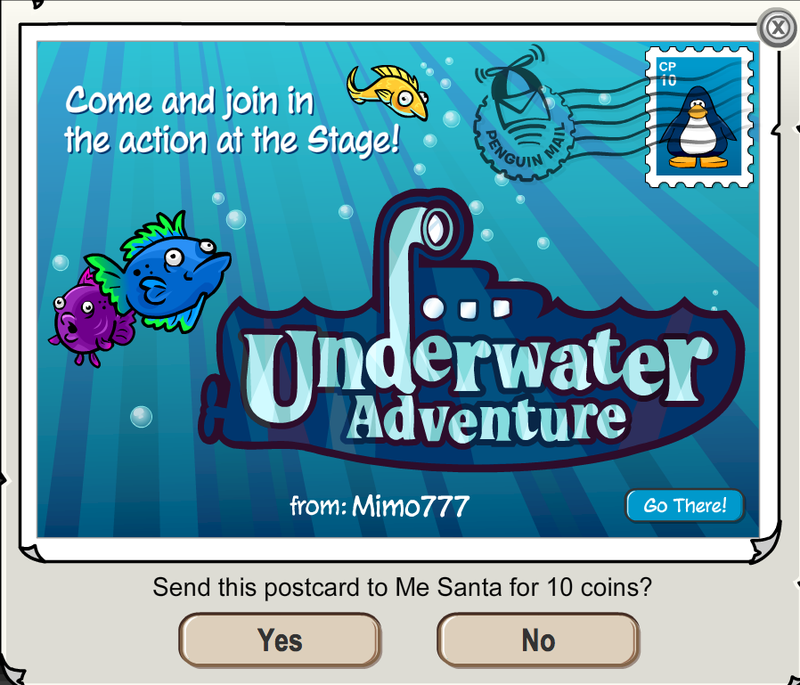 Sorry to brake it to you but it's just for the Underwater Adventure play at the Stage. Slippeestars, in the future, please use proper puncuation. Thanks! And also, I know about this because I am Hungarian, it's a culture, and they have different keyboards because it's a different language. This is a tad unrelated. On CP Are there any cheats for puffle round-up? I'm not bragging but I am so awesome at it! In five minutes, I could get 'bout one and a half thousand coins. No joke! So I was wondering if there was a way to get more coins? BTW Stompin' Bob's name is now Temo Bob!! Ha. That would be funny. With a cherry on top? :)"
Yea I know they're not out yet. And im pretty sure we can trust Billybob, but you never know I guess, we might get surprised. Nice postacard :) But what i really wanted to do was to tell mimo something: I'm sorry about this but i'm gonna be away from CPG for a week (Next week) because i'm going on holiday, Yay camping!! Meh looks like a penguin! Oh... you can always make some new friends by sending them postcards! Yeah, its weird to think the PSA paycheck is now rare! There might be one, because of the end of herberts revenge! P.S. : is what u write when u forget to write something in the first text. Yeah. Exactly. Im Hungarian too but im usually on an American keyboard so i have apostrophe. Theres nothing new. The Costa Rica one is pretty old. and I checked them all. And theyre flags, not pins. Lol i just really want to comment on someone comment on my comment by now! And, i know we can trust billybob. It was just a joke. Only way to get more coins is to be really fast which it seems like you are! Hey Dx, they are pins, if you buy one, they go into the Pins section of your Player Card, then you can put them on. I know a lot of penguins used them to show what teams they wanted to win the Fifa! This is off topic. I don't know if this is true or not, but on some of my cp mail it has a clear PENGUIN MAIL stamp thing with squigly lines. It goes over the penguin stamp. I dont know if this is new(like starting the stamps and book) or if it was already there. Hey Mimo I really want to be a CPG mod. Do I have to have an account or can i just be Anonymous? I would like to know soon. P.S. Scamper I'm your biggest fan. lol, alrighty. I like jokes! I might not get a joke but I like them. I know this doesn't have to do with this, but here is what I wrote to Club Penguin a while ago. would be really cool! Thank you! Thanks for writing in! Although the MP3000 is currently an unlockable item, it would be really cool to see it in the Penguin Style catalog as well. I will definitely pass your feedback on for further consideration. Okay, so here was a link to the What's New blog, but I know it says, don't post links! We are always happy to help, so feel free to write in again if you have any other questions or concerns for us. Mimo! You know the penguin style catolge.Im on my cousins non member penguin and you know the pins in the back for members?He can buy them its very weird. hey mimo i have a glitch.so i waz trying to go on cp but the connecten got lost.the next 2 times it didnt work either so the 3rd time when i went on everyserver had 1,2,or 3 dashes.WEIRD! OMG... I didnt know something this big could be started out of one comment! Dianac, the pins section is called pins and flags. And in the catalog it says Flags 20 coins each. Okay, it's simple, you don't have to have an account, just scroll down to Name/URL and type in your CP Username. Simple As Pie! Yummmm...awww, nice to know you <3 Scamper. Do you <3 me because I answered your question? Now do you understand Slip? It's just a different culture, if you look on the map in Europe, you find Hungary, and that's where Hungarians are. Hope this helps. Club Penguin changed that a while ago. Mimo posted it on his blog two months ago! Keep on commenting. That would be cool- like the "End of the Summer" bash. sigh, its the end of summer for me... its so stupid! thats so cool- ive never noticed that! im going to try that next time im on cp!! ooo camping! im going to go camping soon, only in august! its so much fun! just click on the name/url bubble when your commenting, and then just put what ever name you want in the "name" box. you dont have to put anything in the URL. MP3000? (and you can go in them and drive them). BTW, I also asked if they can make scooters and bikes for non members. So stuff for everyone, or only members? We all do Saavy,we all do. > For months I have been totally against the ever growing prejudice between members and non-members. There has been a rapid rise of member-only items, rooms, games, etc. When Club Penguin made flags in the Gift Shop catalog available for non-members also, I had thought that Club Penguin was going to change, I thought it was going to give more things to non-members. Later, when orange nice puffles appeared and could only be bought by members, that glimmer of hope disappeared. > I have been growing angrier and angrier as the months skirt pass and Club Penguin showed no sign of stopping creating member-only things. A few days ago, when Club Penguin announced more priorities for members, I had enough. > I can't understand why you are not letting non-members take part in so many things. Non-members should be able to buy at least a FEW clothes, and should have MUCH MORE priorities. > Please explain why you are doing this. I understand you need money for development, but this is just ridiculous. Surely you don't need this much cash?" "Thank you for taking the time to contact us with your feedback for the island. I would be happy to discuss with you as to why we offer membership for penguins. We believe that every penguin deserves to play in a fun and safe environment. Club Penguin is all about players building a great community and meeting new friends to waddle around with. With all of the help from our member penguins, we are able to provide many exciting aspects of the game to all penguins. From amazing parties and mini-games, to free items for any penguin to collect. I hope you continue to enjoy waddling around the island and if you have any other questions please feel free to write to us again." "Sorry, but this is not a good reply. I've had this very same response 2 times now, it seems like you are just copying and pasting a written-out reply. I just want to know, how much money do you need to make a new room, game, mission, anything? And please tell me the truth." Everyone, what do you think? I know they are flags, but if you buy one, they appear in the Pins section of the player card. Get it now? If not, tell me what you don't understand. It was no problem! Just helping out a fellow mod! Thanks for the thanks, and I also see you figured it out! CPG Mod in the making! About a few months ago, flags became available for all Club Penguin players. None of my freinds play anymore, so I have no use for postcards, really. Well, at least you get to save your coins. I probably should start collecting them too, but I can't really be bothered. I've got other things to do. Wow! Looks really exciting, Mimo! Yeah, you're right, they better be good.